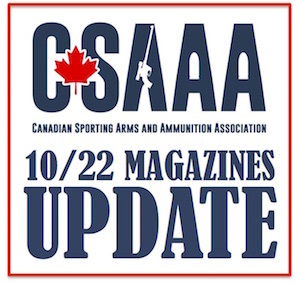 PETERBOROUGH, ONTARIO - The Canadian Sporting Arms and Ammunition Association (CSAAA), representing firearms business owners, has joined with the Canadian Shooting Sports Association (CSSA), representing recreational firearms owners, to empower legal action against the recent decision by the Royal Canadian Mounted Police Firearms Program to prohibit several brands of imported 10/22 extended capacity rifle magazines. The CSAAA and CSSA Boards of Directors voted late last week to raise and contribute funding to a legal defence fund to make this legal action possible. The action will be conducted by noted firearms lawyer Edward L. Burlew, L.L.B. , General Counsel for the CSSA. Mr. Burlew states, "This recent, sudden reversal deprives legal firearms owners of their property rights and attacks their freedom. The RCMP has a duty to every Canadian to act fairly and consistently. The recent decision to reverse position on Ruger 10/22 magazines holding over 10 cartridges is a deliberate move to cause serious worry to hundreds of thousands of Canadians, licenced firearms dealers and importers." Burlew adds, " A Federal Court Class Action on behalf of all persons, individuals, dealers and distributors who now possess cartridge magazines to fit the Ruger 10/22 that can contain more than 10 cartridges will be commenced. The purpose of the action is to seek a judgement that these magazines are not prohibited, to declare the magazine capacity restrictions void as unconstitutional or in the alternative to force a buy-back of each at full retail value. A claim for the intentional infliction of mental distress due to the fear of police action and criminal charges will be included." At this time, due to the controversy, importers, dealers and individual owners are advised to stop sales and transfers of all 10/22 extended capacity (over 10 rounds) rifle magazines. Businesses are cautioned not to attempt to “pin” magazines unless their license specifically authorizes work on prohibited magazines. Individuals are advised not to use, transfer, dispose of, alter or modify, or transport these magazines at this time. We are advising against businesses or their customers surrendering or returning these magazines to anyone at this time. Any information, actions or comments by your Chief Firearms Officer, Inspectors, RCMP or any other law enforcement agency. Business owners interested in joining the class action, are asked to email the above information to the CSAAA at info.csaaa@gmail.com. For more information call the CSAAA at 705-875-2302. If you are the consumer owner of one of these magazines your participation in the action is very much desired. THERE IS NO FEE FOR YOUR PARTICIPATION BUT DONATIONS TO THE ACTION ARE WELCOME. Consumer owners interested in joining the class action, are asked to email the above information to the CSSA at classaction@cssa-cila.org. For more information call the CSSA at 905-571-2150.